The Takamine LTD-2003. Continuing to celebrate the beauty found in nature, Bob chose a bald eagle for this year's limited edition model. This rosette figure extends into the soundhole and beyond the traditional rosette ring boundary at the same time. 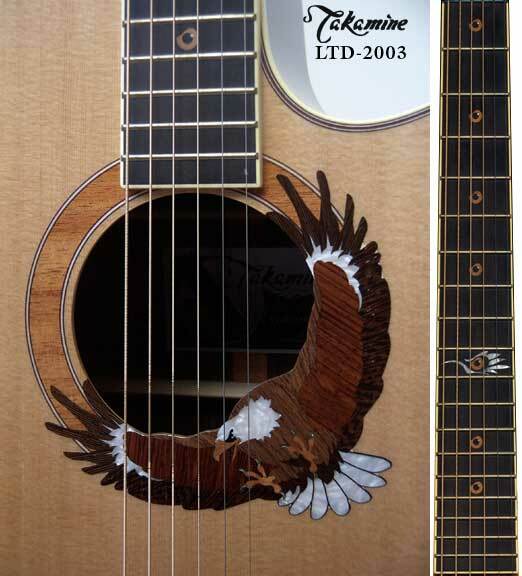 Wood grains were chosen, positioned and cut to add detail to the eagle's wings etc., which also made each guitar unique. The fingerboard markers are piercing eagle eyes, and the 12th fret marker includes facial feathers rendered in mother of pearl.